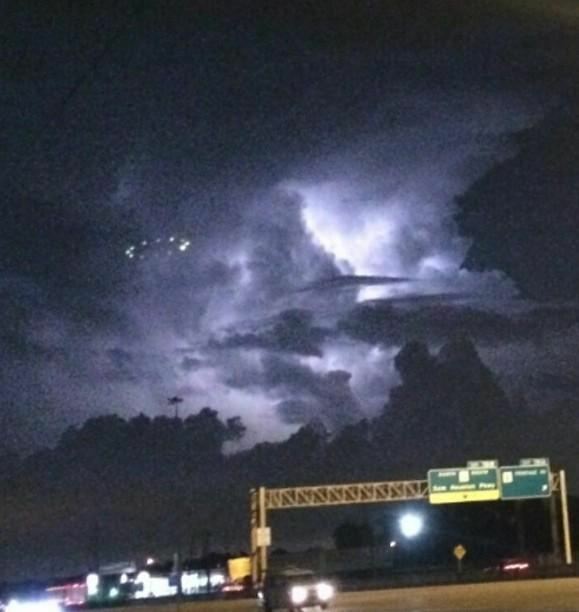 The people of Houston, Texas were greeted with one of the most impressive UFO sightings ever last week after hundreds of people caught a glimpse of a circle of lights floating above the city. The unexplained set of lights were caught on August 11 during a thunderstorm and showed a circle of lights surrounding what appeared to be a central beam. While pictures via Twitter originally showed the lights to be a static object, video footage was then released and showed that actually the lights were completely independent of each other; moving in and out of formation. Usually with mass sightings there is an explanation that follows a few days afterwards — whether it’s a government weather balloon, or an experimental test aircraft. But in this instance there has been no such revelation. Instead Houston citizens and UFO fans have been left pondering with theories ranging from a drone to other suggesting that actually they were just stadium lights. For those hoping to have some form of resolution to the mystery prepare to be disappointed as it appears as though both those theories have been discredited, leaving the floating lights as unexplained. Possible that it might have been multiple ball lightnings trapped in a ring by a magnetic connection ? It is interesting to note that the cloud was visible through the centre of the ring suggesting that the object was in fact several BLs and not something more exotic. What you describe is so exotic itself that it would be even more interesting than an actual craft. Ball lightning is rare enough, to have several examples of this phenomena in a perfect ring would be unique.